I have found two Young Adult books and two non fiction books about extraordinary animals this week, which I would desperately like to read. Also Known as Harper by Ann Waywood Leal - found this one over at Books Love Jessica Marie. I have to say Jessica finds some fantastic YA books and her site is definitely worth a peek. I am hoping this might give me a better insight into preteens as I feel my life is heading in that direction pretty quickly! Harper Lee Morgan is an aspiring poet, which isn’t surprising, seeing as how she’s named after her mama’s favorite writer, Harper Lee. And life is giving her a lot to write about just now. Daddy up and walked out, leaving them broke. Then Harper’s family gets evicted. With Mama scrambling to find work, Harper has to skip school to care for her little brother, Hemingway. Their lives have been turned upside down, which Harper could just about handle—if it wasn’t for the writing contest at school. If only she could get up on that stage and read her poems out loud . . .
Don't you just love the cover too! If I Stay by Gayle Forman - I found this one over at Michelle's site Fluttering Butterflies. Michelle has a similar taste in books to me, so I am always pleased to find a book I haven't read on her site as I know I will love it. Michelle is also running an international competition to give this book away, so do click on Fluttering Butterflies above to go and enter for a chance to win. You have until the 14th July to enter. In a single moment, everything changes. Seventeen year- old Mia has no memory of the accident; she can only recall riding along the snow-wet Oregon road with her family. Then, in a blink, she finds herself watching as her own damaged body is taken from the wreck...A sophisticated, layered, and heart achingly beautiful story about the power of family and friends, the choices we all make - and the ultimate choice Mia commands. The story line sounds just fabulous and reminds me a little of Lovely Bones by Alice Seebold, only Mia isn't actually dead, just in limbo. Another great cover too. Alex and Me by Irene Pepperberg. I found this one over at At Home with Alyce and Alyce gave it a glowing review. This is my first animal non fiction book this week and normally something I would avoid. It isn't that I don't like reading about animals, I just get so upset when I read that they die. So it has to be a really extraordinary book about them to capture my interest. What would normally be a quiet, very private event was, in Alex's case, headline news. 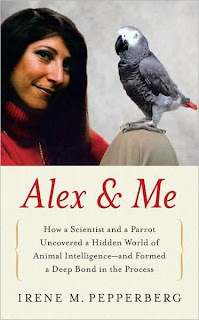 Over the thirty years they had worked together, Alex and Irene had become famous -- two pioneers who opened an unprecedented window into the hidden yet vast world of animal minds. Alex's brain was the size of a shelled walnut, and when Irene and Alex first met, birds were not believed to possess any potential for language, consciousness, or anything remotely comparable to human intelligence. Yet, over the years, Alex proved many things. He could add. He could sound out words. He understood concepts like bigger, smaller, more, fewer, and none. He was capable of thought and intention. Together, Alex and Irene uncovered a startling reality: We live in a world populated by thinking, conscious creatures. Alex and Irene stayed together through thick and thin -- despite sneers from experts, extraordinary financial sacrifices, and a nomadic existence from one university to another. The story of their thirty-year adventure is equally a landmark of scientific achievement and of an unforgettable human-animal bond. A Lion Called Christian by Bourke and Rendall. I found this over at Diane's site Bibliophile by the Sea. This review actually had me in tears. Especially when I saw the Youtube clip. A fantastic and unbelievable story that shows animals are much more intelligent than we give them credit for. In 2008 an extraordinary two-minute film clip appeared on YouTube and immediately became an international phenomenon. It captures the moving reunion of two young men and their pet lion Christian, after they had left him in Africa with Born Free’s George Adamson to introduce him into his rightful home in the wild.A Lion Called Christian tells the remarkable story of how Anthony “Ace” Bourke and John Rendall, visitors to London from Australia in 1969, bought the boisterous lion cub in the pet department of Harrods. For several months, the three of them shared a flat above a furniture shop on London’s King’s Road, where the charismatic and intelligent Christian quickly became a local celebrity, cruising the streets in the back of a Bentley, popping in for lunch at a local restaurant, even posing for a fashion advertisement. But the lion cub was growing up—fast—and soon even the walled church garden where he went for exercise wasn’t large enough for him. How could Ace and John avoid having to send Christian to a zoo for the rest of his life? A coincidental meeting with English actors Virginia McKenna and Bill Travers, stars of the hit film Born Free, led to Christian being flown to Kenya and placed under the expert care of “the father of lions” George Adamson. Incredibly, when Ace and John returned to Kenya to see Christian a year later, they received a loving welcome from their lion, who was by then fully integrated into Africa and a life with other lions. 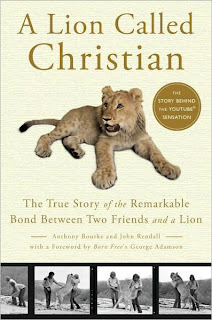 Originally published in 1971, and now fully revised and updated with more than 50 photographs of Christian from cuddly cub in London to magnificent lion in Africa, A Lion Called Christian is a touching and uplifting true story of an indelible human-animal bond. It is is destined to become one of the great classics of animal literature. So there are my picks for the week, now if I can just lay my hands on some cash, I can make a trip to Waterstones! What books are you after this week? Some great finds there - again :) I'm picking up the last Twilight book, Breaking Dawn, this week. Yes I know I'm way behind everyone else. I also borrowed my friends copy of My Sisters Keeper after she raved about it and she loved the film too - thinking I'll need some quiet time to read that one though. Just came across this comp to win a book a day during July :) Good luck! I listened to If I Stay on audio & I loved it, another 5 star read IMHO. Totally agree with you about the u-tube video on a Lion called Christian, the guys are Australian so we have had heaps of documentries screen here and it really is the most beautiful story. I have Alex & Me and A Lion Called Christian on my wish list too. The video with Christian in it made me cry like a baby. Interesting finds. I will check those out. I want to read the first three books you mention! I almost included the first one in my finds this week, but I thought eight was enough! I've heard really good things about If I Stay. I'll have to check it out. Great finds, especially If I Stay and Harper... have a great weekend! I love that cover for If I Stay! I think that A Lion Named Christian looks good too. I actually watched an hour long special about Christian on Animal Planet last night. It was very enjoyable. Omg, I saw that youtube clip a few months ago and I cried like a great big wuss. Would love to read the book now. great finds! If I Stay sounds very good. I do remember the youtube clip of Christian. The book sounds great. Wow, looks like you've got a lot of great finds there! 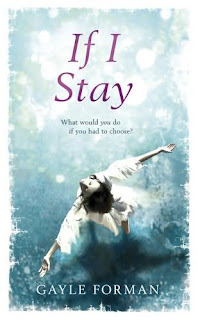 I like the UK cover of If I Stay! Oh, I remember that youtube video! I'd love to read the book too. Those are some great finds, Viv! I'm especially interested in the last one. Great finds Viv - I'd especially like to read If I Stay.